There are three spots in Athens that afford amazing vantage points and the chance to snap some postcard-perfect Instagram shots. To catch the Acropolis bathed in the hues of sunrise, get up bright and early and head up the Hill of the Nymphs, taking Otrineon Street up from the Apostolou Pavlou promenade to the flat area around the National Observatory of Athens (NOA). Make the trek in the evening and you can also join a planet-gazing session at the NOA (with tours in English on Wed, Fri and Sat, 21:00-22:30). Hands down, the best spot for a sunset view is located almost opposite the main entrance of the Acropolis. The Areopagus (“Ares’ Rock”), has served as the stage for many important events both mythological and historical. 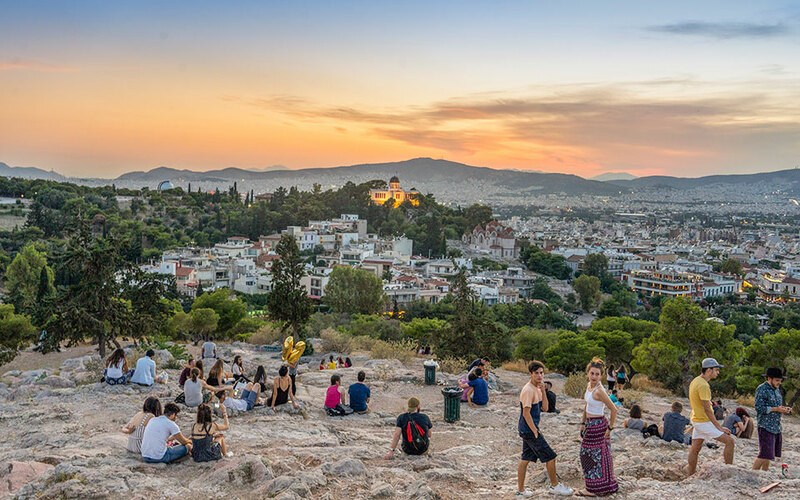 The Athenians call this 155m craggy hill Vrachakia (“Little Rocks”) and flock here on summer evenings to hang out as the sun drops and lights go on across the city. There have, however, been reports of pickpockets and purse snatchers, so keep an eye on your personal belongings. For a 360-degree view of both the mountains and the sea, Lycabettus Hill, the highest point in Athens, can’t be topped – literally. On one side, it affords a view of the Acropolis, with the Saronic Gulf in the distance, and, on the other, of the urban sprawl of Athens and the mountains that hug the city. At the top, you can relax at the Orizontes café-bar-restaurant or on one of the benches outside the Church of Saint George. The fastest and easiest way to the top is by cable car (1 Aristippou; tickets cost €7 round-trip and €5 one way). If you decide to walk down, take the path behind the church that leads down to Kolonaki – along the way, you’ll see dozens of huge Barbary fig cactuses on which people have etched their names.